So far in The Splendid Sampler we have pieced tiny pieces, embroidered, and appliqued. I learned so much by challenging myself with those blocks, but yesterday's block was a sweet relief. Simple Simon by Celine Perkins was quick and easy to piece. As simle as this block was, I still had to piece mine twice. I didn't like the way my green striped lined up the first time so I ripped it apart to make sure that the center horizontal strip looked like it was going straight across. I may make this a third time, cutting those horizontal pieces more carefully, but then again I might just leave well enough alone. If you want to see everyone else's block, click HERE. If you want to be tempted to start a new quilt, click HERE to see Celine's quilt that she made from all Simple Simon blocks, triangles, and sashing. Oh Celine, you are tempting me! I am dreaming of all of the fun ways I could quilt this block and can't wait to start sharing my tutorials with you. 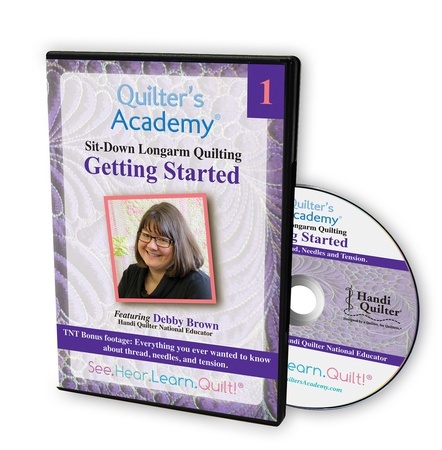 Until then, if you quilt on a sit-down longarm machine you might benefit from my Handi Quilter Sit-Down Longarm instructional DVDs. So, what would you do with my block? Should I re-cut the green horizontal strip and re-piece it? Or let good enough alone? I live on the Appalachian Trail. My house is deep in the forest and my trees average 100 feet tall. If the trees remain standing, they cause little problem. When trees fall, however... Yeah, we worry about that. Last week while I was teaching in Calgary, AB, Canada a wicked storm with heavy "sideways" rains and high winds hit my house. Our home and property sustained some damage, but we are quite grateful that it wasn't much, much worse. This tree has been dead since we bought the house 14 years ago. It was tall enough to hit the house if it fell, but it seemed to be leaning sideways so we didn't pay the thousands of dollars it costs to remove this particular tree. We have removed many, many others. It bisected my rhododendron and hit the deck. Fortunately, the tree broke instead of breaking the deck. The rhododendron might not survive. It took heavy damage from an ice storm 6 years ago and has been funny-looking ever since. I don't think a tree ripping through its middle will help the rhododendron's overall health. We have other less impressive yet more expensive damage to deal with, but are mostly grateful that the tree wasn't 15 feet longer and healthy. It would have crashed through my sewing room had that been the case. So, if a tree falls in the woods, pray that it's a dead tree and the tree breaks apart instead of breaking your house. It took me a while to figure out what it was supposed to be. These fabrics were left from a quilt that I can't remember to save my life. Seriously. I've been trying to remember what they were originally from for over a month and... nothing. I had to trim triangle pairs while making Aunt Doris' quilt. I used the leftover triangle bits to make these placemats. I hope Mom enjoys her February placemats! The Splendid Sampler -- Happy, happy! I am in love with the fabulous Jen Kingwell and I adore her Splendid Sampler block Happy, happy! Did you notice my block on The Splendid Sampler page? I want to think that my block is the cutest one ever, but some of the other blocks were adorable! It is pretty cute, right? I used Reynolds Freezer Paper to stabilize the vase for hand applique. I used Karen Kay Buckley's Perfect Circles to make my fussy-cut flowers. To make my applique easy, I used 100 weight applique thread, straw applique needles, and applique pins. For the embroidery, I used Tulip Embroidery needles and 12 weight embroidery thread. 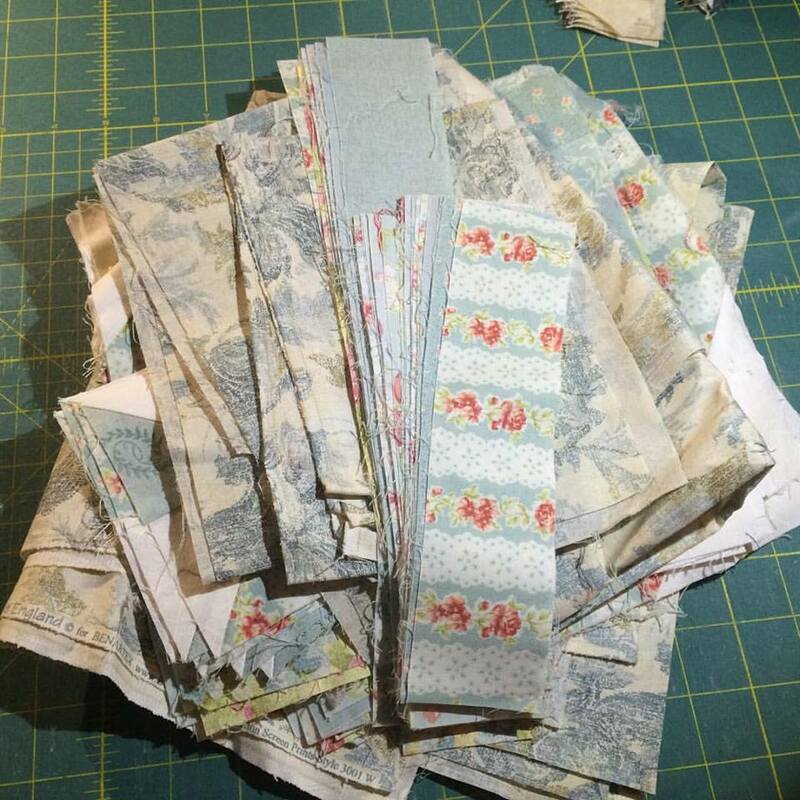 Every project is better when I use Karen Kay Buckley's "the most awesomest scissors ever", especially when I use them on April Rosenthal's Meadowbloom fabrics. I love my perfect circles and having fussy cut them all was super-fun! If you want to see everyone else's block, click HERE for the gallery. 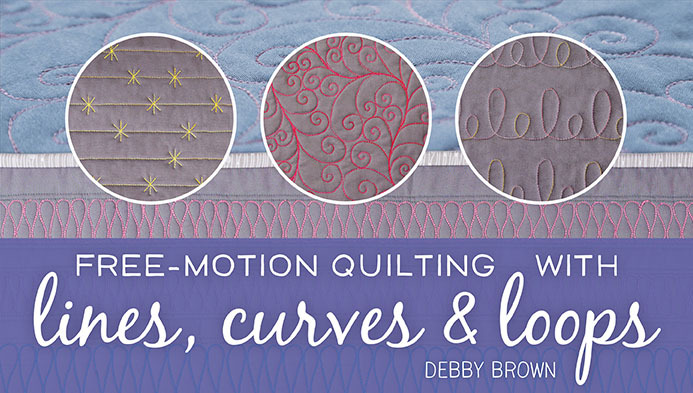 I plan to start the machine quilting tutorials in the next two weeks. To make sure you don't miss my post, sign up for my newsletter HERE. I am so tickled with The Splendid Sampler block three -- Lots of Love! Thanks, Melissa Corry, for a great block! These hearts were very tiny with lots of little pieces. Several times I wanted to shout "I'm a machine quilter, Jim, not a piecer!" (Star Trek reference). I wanted to be certain to show my first attempt, though, to show the impact of re-piecing my block. I was able to fix those points by carefully measuring, carefully trimming each section after piecing, and pinning carefully. If you want to see other beautiful Lots of Love blocks, click HERE and scroll down. Isn't this 100 on the cute scale? I haven't embroidered much in the last two or three decades (OK, maybe four decades? ), but I really enjoyed this! I hope there will be a lot more embroidery in the next 98 blocks of The Splendid Sampler. If you want to see everyone else's beautiful blocks or add your own to the collection, CLICK HERE. I will be providing machine quilting tutorials for this sampler quilt throughout the year. 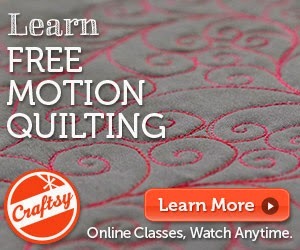 If you are looking for instruction about how to custom quilt a quilt, I'm very proud of my Craftsy Class "You Can Quilt It!" I have a friend (cough*Jessica*cough) who is trying to change me from a "Look, a new quilt that I Must. Make. Now!" quilter with 1,000 in-process quilts into a "Start one quilt and finish it" quilter. This is a Sisyphean task, but I appreciate her encouragement in the face of futility. To humor her, I am trying to finish up some of the quilts that I have started. Remember my Square Dance quilt from BLOCK? Those who know me will easily guess what Bella (my Handi Quilter Fusion) and I are machine quilting all over this quilt -- RIBBON CANDY! I'm using Midas Touch from my new thread line -- FabuLux from WonderFil -- for the quilting. The quilting is a slow process since I'm suffering from the plague this week. Stitch a little, cough a little, sneeze a little, stitch a little, repeat. Since I've started writing this post, I've already thought of three more quilts I want to start. Poor, poor Jessica. It's here! It's finally here! The first block from The Splendid Sampler is finally here! Pat Sloan and Jane Davidson have done a great job organizing this project and I've been on pins and needles waiting for the first block to finally post! I just want to hug and squeeze and pet this block non-stop! I pieced the block according to the directions and then chose to hand applique the heart onto the block. I cut the heart out of Reynold's Freezer Paper and ironed it to the back side of the fabric. Then, using my Karen Kay Buckley "most awesome scissors in the world", I cut the fabric leaving approximately 1/4"of fabric all of the way around the heart freezer paper. I pinned the heart to the block using teeny tiny applique pins. Shorter pins provide less opportunity for the thread to get caught on them. Ask me how I know! I use a really thin thread and a straw needle to take tiny stitches all of the way around the heart, turning the extra 1/4" of fabric to the inside so the heart has a beautiful edge. 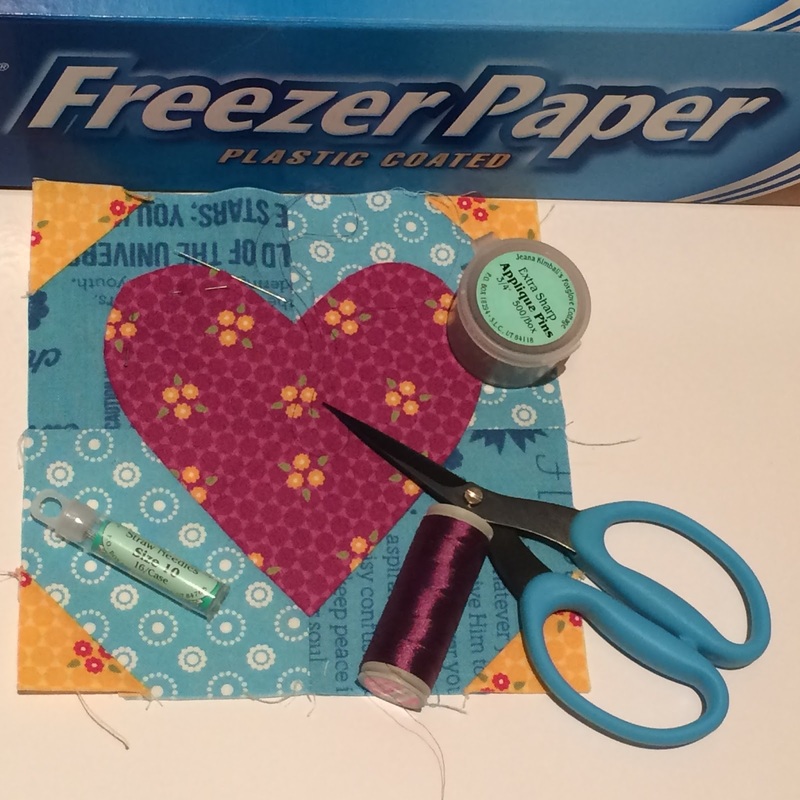 Once the stitching was complete, I used my "most awesome scissors in the world" to cut a small slit in the fabric behind the heart to remove the freezer paper. If you want to see all of the different Hearts Aflutter blocks in a range of gorgeous fabrics, CLICK HERE. I had so much fun making this block and have so many ideas about how to quilt it! While I won't be showing a tutorial on how to quilt each and every block, I will feature several blocks throughout the year. Do you want to see a tutorial about this block? While I'm making some more progress on Lazy Sunday, I'm still only on step 2. I have to make a different block 96 times before I'm finished with step two. My favorite Aunt in the whole world isn't really my aunt. She's a dear woman at church that is everyone's aunt. She babysat my children in the nursery when they were young and is faithful to pray for us all. This fabric was leftover from another quilt and, for the life of me, I can't remember the original quilt. I'll have to read through my blog archives to see if I can find it. Even though I can't remember the fabric's origin, I eventually figured out what I had planned for this pile of fabric -- Bonnie Hunter's Pineapple Blossom quilt! When I gift a quilt to a friend at church, I can usually count on a Sunday afternoon phone call. My aunt called after church, right on schedule. She was delighted! I am absolutely in love with this little block and can't wait to make 100 more of them over the next year! Did you make the Bonus Block for The Splendid Sampler? Did you make the Folding Block Station? Are you anxiously waiting for Sunday when the first of 100 blocks goes live? Participants are sharing their photos of this block HERE. Enjoy scrolling through all of the lovely blocks! I don't love driving in the snow, but I do love the Star Wars effect that the snow makes. Fortunately, I followed a snow plow/salt truck or three to the airport and made it there with only minor sliding on the secondary roads. Even more fortunately, the flight took off! This put us about 90 minutes behind, but I actually prefer my planes neat (without ice). They seem to work better that way. There's a shocking lack of snow here in Phoenix, but I'll try to muddle through. The 85*F temps are gonna be tough to take as well, but I'll try to endure. I can't wait to meet the quilters at AQS Quilt Week in Phoenix tomorrow! I am so excited to be a part of The Splendid Sampler where Pat Sloan and Jane Davidson have gathered 82 designers together to share 100 blocks over the next 12 months. I am beyond thrilled to be providing machine quilting tutorials throughout the project. Before I can start quilting, though, I have to pick fabric for the quilt! This fabric makes me absolutely giddy! To make it even more perfect, though, April is one of the designers for The Splended Sampler. This was truly meant to be! Are you planning to play along with The Splendid Sampler? What fabrics did you choose? I've been working on my Square Dance quilt from the latest issue of Block Magazine from Missouri Star Quilt Company. I worried that since the quilt is mostly brown that the yellow would be out of place. Pleasantly, the yellow is PERFECT! This yellow brings out the "golden" in the golden browns! I'm ready to quilt this quilt and had two threads picked out: Mudpies and Midas Touch from my new line of FabuLux thread from WonderFil. Mudpies is a warm variegated brown and would have been pretty on this quilt, but the Midas Touch is a golden brown variegated and, I think, will be a better choice for this quilt. I am hurrying to get some UFOs finished so that I don't set them aside once the fun of The Splendid Sampler begins next Sunday. Are you planning to play along? I will be providing machine quilting tips for this project throughout the year and am so excited about it! 1. I listen to books while I quilt. 2. It is difficult to quilt while crying. I finished this book the day that Alan Rickman died. I have nothing else to say. The Martian -- I loved the book more than I have words to say. It was my favorite read of all of 2015. I really love the movie, too! The Intern -- This isn't usually my type of movie but it was very, very sweet. It was odd that I related more to DeNiro's character than Anne Hathaway's. I am getting old. Unbroken -- I will watch or read anything about WWII unless it involves concentration camps. I can't go there. I must admit that it was an odd feeling watching a movie about a Japanese internment camp while on a plane full of people going to Japan. A Lego Brickumentary -- I now want to be a Lego master craftsman. The documentary talked about shows and events where people gather to discuss and share their love of Lego bricks as if it was an unusual thing. As a quilter, my reaction was "Yeah, so? That sounds perfectly normal to me." The entire Twilight Series -- don't judge me. Pride and Prejudice -- I watched the Keira Knightley version of this movie over 20 times this month. No exaggeration. Could have been 50 times. I don't really know. The movie might be playing in the background whilst I write this post, but that's only a rumor. Pride and Prejudice -- I watched the Colin Firth mini-series for the very first time. It was lovely! I could happily live inside of Jane Austen's books! I'm going to listen to all of Jane Austen's books while I'm working on my blocks and tutorials for The Splendid Sampler this year! Do you read through Jane Austen's works every year? Or is it just me? I'm a frugal person. I believe in the old saying and I apply it to quilting. 4. Do Without -- ARE YOU CRAZY? 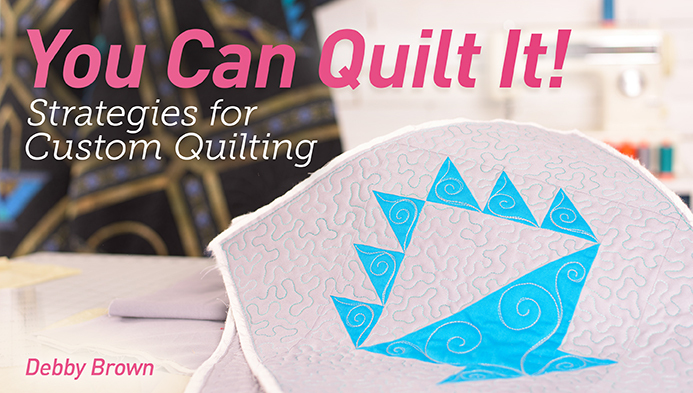 I'd never do without quilting or quilting fabrics. That's just plain wrong. And then there was no more fabric left. I have completed some of part 2 of this 4-part mystery. So basically, I am not even close to done. At least I'm making progress, right?